Should the Chinese Communist Party be concerned about the Mandate of Heaven? Due to the Mandate of Heaven, many of China’s people see rebellion as a birthright under the right circumstances. The Mandate of Heaven has been traced back to 1753 B.C. or earlier. With the Mandate of Heaven, the right to rule from divine legitimization to one based on ‘evenhanded’ rule was born. Whenever a dynasty fell, the reason offered by China’s wise men was the loss of the moral right to rule given by Heaven alone, because, for a good government, Heaven sends down all blessings, but on the evildoer, Heaven sends down all miseries. However, China’s leaders, like leaders all over the world, were free to rule unjustly and could harm the people they ruled but the thinking was that their rule would come to a swift end as Heaven passed its mandate to another family or group. It’s thought that Heaven blessed the authority of a just ruler, but would be displeased with a despotic ruler and would withdraw its mandate. In addition, severe floods or famines might be considered evidence of divine repeal of the Mandate of Heaven. As long as the ruling family or political party rules fairly and justly, the majority of Chinese people will see no need to call for change or rebel. What is the closest thinking to the Mandate of Heaven in the West? Here’s my choice for the United States. Thomas Jefferson, one of the Founding Fathers of the United States, said, “The tree of liberty must be refreshed from time to time with the blood of patriots and tyrants.”? Since I started this post with a question, I’ll end with one. 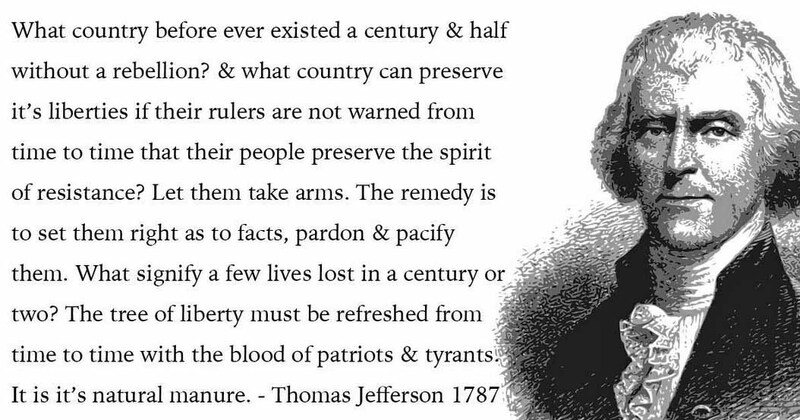 Should the 45th President of the United States be concerned about the Mandate of Heaven and Thomas Jefferson’s advice? Please let me know what you think in the comment section. This entry was posted on Wednesday, July 19th, 2017 at 05:00 and is filed under China, Chinese Culture, Chinese history, cultural differences, history, Lloyd Lofthouse, politics. You can follow any responses to this entry through the RSS 2.0 feed. You can leave a response, or trackback from your own site. 6 Responses to Should the Chinese Communist Party be concerned about the Mandate of Heaven? Fundamentally, of course, any President should possess, within himself, the desire to mete out JUSTICE during his term, if it is possible for him to do so. The problem is that the U.S. is NOT a country that is ruled even by its elected officials. The United States is a country that is ruled by a network of powerful, private interests. The President of the United States has a GIG. That’s all. He is NOT hired by the people, through voting. To believe that voting puts a President into office is, for the most part, an illusion. In the case of Donald Trump, it MIGHT have been said that he had bucked the system, and surprised everyone, by being legitimately voted into office.. But now that he’s been in office for a while, anyone should be able to see that he APPEARS to be following a script written NOT by the people, but by private interests. That’s another way of saying that, if the “Mandate of Heaven” is invoked, due to the corruption of the leadership; and if that corrupt leadership corrupts the rest of society; and if “the Prophets,” or A Prophet comes to warn the people [Could such a “Prophet” be a poet? Or a musician? Or must he be a God-sent, religious Prophet? ], but then the people ignore that Prophet, then that civilization will be destroyed. And THAT’S where we are now in the U.S. In fact, our civilization HAS been destroyed–a long time ago. But most people would not agree with me. We are GONNERS. We’re finished. The 45th President is now HELPLESS. So to was the 44th President. The Koch brothers want to convene a Constitution Convention and rewrite it turning the U.S. into a fascist, white supremacist, autocratic, neo-libertarian state where the power of government rests in the hands of the members of ALEC, one of many subversive organizations the two brothers founded and funded to destroy this republic. “A network of think tanks across the country is quietly pushing the agenda of right-wing groups with funding from Koch brothers-affiliated organizations, a new report alleges. Wow. It never ends. Sometimes I contemplate what I consider to be the “duty” of the U.S. military to defend this country–that INCLUDES defending it from entities INSIDE the country. I sometimes wonder if the military should simply take over. But, my GOD!!! What are we going to DO!!?? The country is ALREADY in a mess–and not only from right-wingers. I was born and raised a Democrat. But after serving as an independent journalist, in 2011, covering NATO’s assault on Libya, I was shocked at the ferocity of Barack Obama, and his then Secretary of State, Hillary Rodham Clinton, in their support of the destruction of the most progressive country on the African continent: Libya. Gaddafi had been somewhat of a NUT, in his earlier career. But he mellowed out. He successful raised the Libyan standard of living to the highest in all of Africa. Libya had the longest lifespain of any African country. I think it was age 79. He FREED the women–which the mullahs of the Muslim world hated with a deep passion–allowing them to drive UNESCORTED, anywhere they wished. He allowed them to marry FOR LOVE. And if a Qadi (judge) discovered that a woman had been forced into a marriage, by her male relatives, that Qadi would nullify that marriage and allow that woman to be free again. One of the first fatwahs issued by Ayatollah Khomeini was against Gaddafi. Why? Because Gaddafi freed the women, and Khomaeni, HATED that. Hillary Clinton worked with the Muslim Brotherhood of Egypt to help in the overthrow of Gaddafi. The Brotherhood hated him for similar reasons. Gaddafi was ahead of his time. By Middle East standards, that man was a feminist. On the day that Tripoli fell, even a white, conservative American CRIED at his YouTube channel, because of the utter injustice and cruelty of what happened. How SICK can one get!? She LAUGHED at the murder of a head of state who was not even given a trial. At least Sadaam was put on trial. She laughed. Honestly, I don’t know WHAT I am politically. But I know this: I’m not a Democrat. And I’m not a Republican. I sometimes wonder if the anarchists have a point. Politicians–EVERYWHERE–appear to be scum. Maybe things will change. But it doesn’t look like it. #FakePresident Donald Trump has already broken the oath he took when he became the presdient of the United States and the U.S. military and its officers have already broken their oath by not defending the U.S. Constitution from Donald Trump. The Kremlin’s Agent Orange has already trashed the 1st Amendment and Article III of the U.S. Constitution. #FakePresident Trump was supposed to “preserve, protect and defend the Constitution of the United States” not attack freedoms that are protected by that Constitution and encourage his supporters to attack them. He was encouraging these attacks before he took the oath of office and continued after he did. In addition, he invaded the federal government to destroy it from within when he appointed his “beachhead” teams to the departments of the federal government to dismantle them and strip those agencies of the powers they have that came about because of the flexibility of the U.S. Constitution. But that is not what the U.S. Constitution allows a president to do – to mete out justice. That job is for the judicial branch: the courts from the states all the way to the U.S. Supreme Court that is the final arbitrator. A U.S. president cannot create laws and/or legislation that leads to new laws. That power resides with both Houses of Congress.